Enjoy 4* accommodation at Westwood Country House Bed and Breakfast Blarney, a luxurious family 4 Star Irish Tourist Board Approved B&B accommodation in Blarney set in breath-taking surroundings, just outside Blarney town. Your hosts Eucharia and Fergus will be delighted to welcome you into their home – greeting you with freshly brewed tea and homemade scones on your arrival, and accommodating your every need from arranging tours to satisfying your taste buds with homemade Irish cuisine, where we use all local produce including our own Fresh Free Range Eggs – demonstrating the true meaning of Irish hospitality. 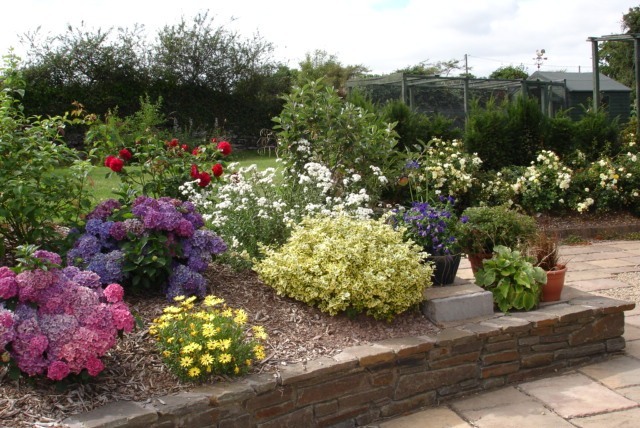 Westwood Country House B&B Blarney is surrounded by 2 acres of landscaped gardens and paddocks, and set in unspoilt countryside, its serenity is unsurpassable. There is even a pretty stone patio reserved especially for guests, where you can absorb all the beautiful sights and sounds the Irish countryside has to offer. Undisclosed by its peaceful setting, it is only 5mins drive from Blarney Castle and the world renowned Blair’s Inn. It is perfect for golfers, with Muskerry golf club only 3 minutes away and the nearby rolling countryside is a haven for walkers. It is also an ideal base for touring other parts of the south such as; Cobh, Kinsale and Killarney and is located only 25minutes drive from Cork airport. Cork Airport Car Rentals have a great selection of cars. Happy Christmas and all the very Best for 2016. We stayed here last year, and while looking up the location to refer a friend, I have beautiful memories of staying here. I would definitely recommend to you. Wishing I could return, but will send my friends in my place. Well, this messages was a long time coming. I just wanted to say hello and tell your visitors what a lovely time my family and I had during our two-night stay in late June of 2010. Fergus was away at the time, but Eucharia took wonderful care of us. We were a group of seven (my wife Kelly, her sisters Brenda and Mary, her father Brendon, brother Tim and Brenda’s husband Frank. And me) from Florida. Wonderful food, beautiful grounds and scenery and a stunning home. We recall the first night we stayed that we returned from dinner nearby and Eucharia spent a few minutes in the parlor with us chatting as we had a night cap. She was planning on turning in early, but instead stayed up with us for some time, telling us all about her home and family. I was looking at a map I created for our drive to Cork and saw the Westwood Hours marker on it, so I clicked through to this site. Even though it’s been five years, our stay there was more than memorable. I would strongly advise anyone visiting Cork or the surrounding area to book and visit with these wonderful hosts. And Eucharia and Fergus, we hope to see you gain in the very near future. Hi Joe, We are delighted you took the time to send us your message, and particularly We are happy that you remember with fondness your stay with us. We are still enjoying, meeting & sharing our home with wonderful Guests from around the World. Fergus is now retired from his peacekeeping tasks in difficult parts of the World and loves to meet new and interesting people and of course like most Veterans, share a story or two from his forty years of Military Service, most in the great cause of peace with The United Nations & OSCE. Hopefully you all will visit Ireland again and love to meet you. Best wishes for a healthy and happy 2016.
we had a wonderful stay at Westwood Country House in August 2015. We loved that there was just one table for all guests, so you got to know people from around the world. The house is very nice and clean, the garden’s pretty and your dogs are adorable. Hope to see you again! Thanks a lot! and exchange of travel information with our other Guests. Our little Jack Russell’s, Penny & Lexie are still healthy & adorable. My sister and I stayed at Westwood in Apr 2014. It was our FAVORITE B&B on our 8 day trip to Ireland. They were amazing hosts. Bedrooms were very comfortable. Breakfast was a dream. Thanks for an amazing memory. We spent the most amazing week long holiday with Fergus and Eucharia at Westwood. To say we felt at home is understating…we were part of the family. We will remember our time in Cork forever. The facility was lovely, extremely comfortable and readily accessible for traveling throughout the southern part of Ireland. We visited from Waterford to Killarney and all parts in between. Fergus made a great travel guide through his daily recommendations. We will always consider he and Eucharia dear friends!